Today's date is a good time to get started on a path to determine whether or not your symptoms are caused by MS and by learning all you can about how to live with Multiple Sclerosis Disease. The peak age of onset of Multiple Sclerosis Disease is between ages 20 and 40, although it may develop in children and has also been identified in individuals over 60 years of age. Multiple Sclerosis Disease (MS) typically consists of muscle symptoms such as a problem with balance or loss of balance, muscle spasms, numbness or unusual sensations in any body area, problems moving arms or legs, coordination of arms and legs, problems walking, problems with overall coordination and making small movements, a feeling of clumsiness, tremors in arms or legs, unusual weakness or weak feelings in arms or legs. 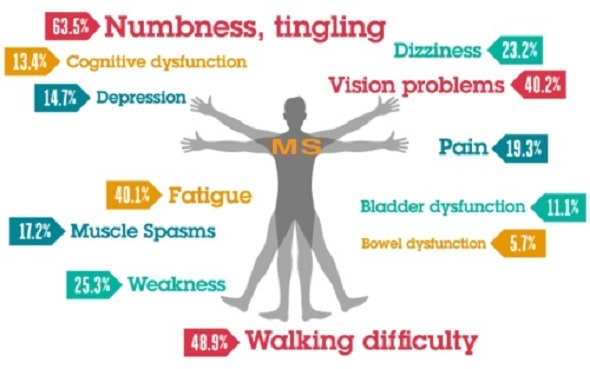 Most people experience their first symptoms of MS between the ages of 20 and 40; the initial symptom of MS is often blurred or double vision, red-green color distortion, or even blindness in one eye. 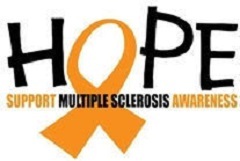 Most MS patients experience muscle weakness in their extremities and difficulty with coordination and balance. These symptoms may be severe enough to impair walking or even standing. In the worst cases, MS can produce partial or complete paralysis. Most people with MS also exhibit paresthesias, transitory abnormal sensory feelings such as numbness, prickling, or "pins and needles" sensations. Some may also experience pain. Speech impediments, tremors, and dizziness are other frequent complaints. Occasionally, people with MS have hearing loss. Approximately half of all people with MS experience cognitive impairments such as difficulties with concentration, attention, memory, and poor judgment, but such symptoms are usually mild and are frequently overlooked. Depression is another common feature of MS. Beta interferon has been shown to reduce the number of exacerbations and may slow the progression of physical disability. When attacks do occur, they tend to be shorter and less severe. The FDA also has approved a synthetic form of myelin basic protein, called copolymer I (Copaxone), for the treatment of relapsing-remitting MS. Copolymer I has few side effects, and studies indicate that the agent can reduce the relapse rate by almost one third. Other FDA approved drugs to treat relapsing forms of MS in adults include teriflunomide and dimethyl fumarate. An immunosuppressant treatment, Novantrone (mitoxantrone), is approved by the FDA for the treatment of advanced or chronic MS. The FDA has also approved dalfampridine (Ampyra) to improve walking in individuals with MS. Physical therapy and exercise can help preserve remaining function, and patients may find that various aids -- such as foot braces, canes, and walkers -- can help them remain independent and mobile. Avoiding excessive activity and avoiding heat are probably the most important measures patients can take to counter physiological fatigue. If psychological symptoms of fatigue such as depression or apathy are evident, antidepressant medications may help. Other drugs that may reduce fatigue in some, but not all, patients include amantadine (Symmetrel), pemoline (Slighter), and the still-experimental drug aminopyridine. Although improvement of optic symptoms usually occurs even without treatment, a short course of treatment with intravenous methylprednisolone (Solu-Medrol) followed by treatment with oral steroids is sometimes used. The National Institute of Neurological Disorders and Stroke (NINDS) and other institutes of the National Institutes of Health (NIH) conduct research in laboratories at the NIH and also support additional research through grants to major medical institutions across the country. Scientists continue their extensive efforts to create new and better therapies for MS.
One of the most promising MS research areas involves naturally occurring antiviral proteins known as interferons. Beta interferon has been shown to reduce the number of exacerbations and may slow the progression of physical disability. When attacks do occur, they tend to be shorter and less severe. In addition, there are a number of treatments under investigation that may curtail attacks or improve function. Over a dozen clinical trials testing potential therapies are underway, and additional new treatments are being devised and tested in animal models.